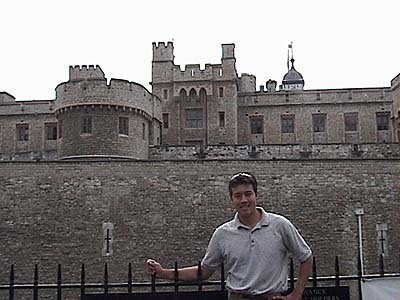 Next on our British tour list: the Tower of London. The guards told colorful stories about the British royalty imprisoned or executed here. We also enjoyed reading 600 year old graffiti left by the prisoners. In the evening we had dinner with new travel friends that we met abroad. While in Africa, we had traveled with Lady Wimborne Guest and her daughter, Ilona. They had graciously invited us to their Chelsea home upon our visit to London. Of course we can't turn down free food. Even better, they allowed us to invite another friend, Angus Murray, whom we had met in China, so this dinner became a traveler's reunion for us. Wish we had better clothes to wear at these things. In hip and cosmo London we're looking like safari rejects. I should be locked away in the Tower of London for wearing these drab clothes day after day.